The more you practice, the better you get. 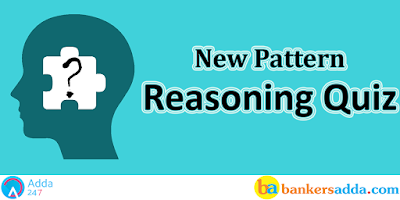 So, to let you practice and ace the score in the Reasoning Section of all the Banking Examinations, Bankersdda is proving you with Reasoning Questions and Answers on various topics. Try to attempt these question yourself to score in upcoming IBPS RRB PO Mains, IBPS RRB Clerk, IBPS Clerk, other banking and insurance exams. Seven friends J, K, L, A, B, C and D who got married to their female friends i.e. P, Q, R, S, T, V and W but not necessarily in the same order. They all married in a same week starting from Monday but on different days and not necessarily in the same order. They all belong to different cities i.e. Lucknow, Delhi, Kanpur, Varanasi, Agra, Jaipur and Gurgaon but not necessarily in the same order. L belongs to Lucknow. The one who belongs to Agra city married with V. A married with S but one of the day after Thursday. B get married on Wednesday and he belongs to Kanpur. D get married on Sunday but he does not marry Q or V. There are two day gap between the one who belongs to Lucknow and the one who belongs to Jaipur. K belongs to Delhi and he married with R on a day immediately after J who belongs to Varanasi. C belongs to Agra and get married on the day immediately after L but before the one who belongs to Jaipur. K belongs to Delhi and get married on the day immediately after the one who marry with P. The one who get married on Monday does not belongs to Jaipur or Lucknow. B does not marry with Q or W.
Q1. Who among the following belongs to Jaipur? Q2. Who among the following married with T? Q3. The one who belongs to Varanasi married with? Q4. The one who belong to Agra married on which day? Q5. L get married on which day of the week? Directions (6-10): Each of the questions below consists of question and two statements numbered I, and II given below it. You have to decide whether the data provided in the statements are sufficient to answer the question. Read both the statements and give answer. (a) If the data in statement I alone are sufficient to answer the question while the data in statement II are not sufficient to answer the question . (b) If the data in statement II alone are sufficient to answer the question while the data in statement I are not sufficient to answer the question. (d) If the data in both statement I and statement II are not sufficient to answer the question. (e) If the data in both statement I and statement II are sufficient to answer the question. Q6. Who among the M, O, P, Q, R and S is the smallest in height? I. O is taller than P and Q but smaller than M. R is taller than M, but not the tallest. II. S is taller than R and O. P is smaller than Q.
Q7. Who among the following five i.e. A, B, C, D and E is sitting on the middle of the row (all are facing north direction)? I. E sit 2nd to the left of B and on the immediate right of D. B sits on the immediate left of C, who sits on the right end. II. A sits 2nd to the right of C who sits on left end of the Row. E is not the immediate neighbour of A.
Q8. On which day does Rohit celebrate his birthday ? I. Rohit’s brother remembers that his birthday is before 25th November but after 22nd of November. II. Rohit’s mother remembers that his birthday is after 21st November but before 24th of November. Q9. How is M related to N? I. M is married to P. N is brother of R and the son of P.
II. P is Father of N. M is the child of T, who is married to P.
Q10. In which direction is in Rahul with respect to Raman? I. Rahul is facing north and Raman is facing east and both are standing in front of Raman’s house. Raman and Rahul started walking in their respective directions and both walks for 5km. II. Rahul is to the south of Amaan. Raman is to the north of Shikha, who is 2m away from Amaan. Sol. Both the statement are required to answer the question. Sol. From statement I it is clear that A sits in the middle of the row. And From statement II it is clear that A sits in the middle of the row. Sol. Both the statement are required to answer the question i.e. Birthday is on 23rd November. Sol. Both the statement are not sufficient to answer the question. Sol. From statement I it is clear that Rahul is in North-West direction with respect to Raman. 'jo na su' means 'very good ball'. Q11. What is the code for “boy”? Q12. What is the code for “Good”? Q13. Which of the following word coded as ‘nu’? Q14. What will be the code for “Very good girl”? Q15. Which of the following word is coded as ‘su’?